Demanding ascents, a picturesque valley, unique foliage, wild animals and fairytale lakes – in the heart of pristine nature and just a stone’s throw away from Bled you can find all this in the Triglav National Park, named after the highest Slovenian mountain that lies almost exactly in the heart of the park. 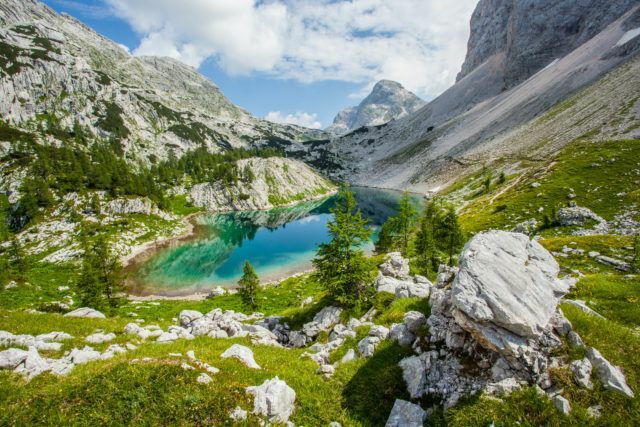 Triglav National Park is the only national park in Slovenia and it carries out a special nature conservation regime that is more stringent than in the usual landscaped parks. It was given the name Triglav after the peak rising 2,864m and it extends from the north-west of Slovenia near the border with Italy to the Austrian border in the south-eastern part of the Alpine massif. The park makes up for 4% of Slovenia’s total surface area and it is one of the oldest National parks. Its uniqueness is in its diverse unspoiled nature, the rich flora thriving there and also being home to numerous protected animals. Its valleys and plains are covered with carpets of green forests and pastures, above which the vertiginous peaks of enchanting and jagged forms rise from the earth like great stalagmites. Through numerous ravines, beautiful gorges and valleys (Vintgar Mlinarica, Mostnica) flow the purest mountain streams and small rivers, which eventually merge into two major rivers – the Sava and the Soča. High in the mountains lie the Triglav and Kriška lakes and in Bohinj can be found Lake Bohinj, the largest permanent natural lake in Slovenia. In the park’s remotest areas the ancient landscapes typical of the farms and homesteads in this part of Europe can be peacefully experienced, whilst high in the mountains are the mountain pastures where livestock graze and where the traditional cheese is made, for which the area is famous. Many sports activities can also be done in the park, the only restrictions being that they do not interfere with the natural environment, which needs to be treated with great respect and without any pollution or destruction, and that the safety of individuals participating is ensured. Hiking, climbing, running, biking, flying, water sports, golf and winter sports on the snow – all you have to do is choose your favourite. In Triglav National Park one feels very green, surrounded by such an inspirational landscape, and we encourage you to go green too when choosing an incentive programme. You can, for example, decide on a day in the Triglav National Park where participants get to discover the local cattle herding traditions. In the middle of the Triglav National Park’s unspoiled nature is Pokljuka, one of the most famous Slovenian plateaus where world famous competitions in biathlon are held. Slovenia’s highest plateau stretches a full 20km in length and almost the same in width, and has shown itself to be a master of change, displaying a completely different face in winter than the one presented in the summer months. In spring, summer and autumn Pokljuka is perfect for running and hiking, and in winter time it is perfect for winter skiing, ski running, cross-country skiing, snowshoeing, Nordic walking, Geo-coaching, guided tours or just simple sledding in the middle of Pokljuka’s snowy forests.